Robert Rauschenberg, the irrepressibly prolific American artist who time and again reshaped art in the 20th century, died on Monday night at his home on Captiva Island, Fla. He was 82. 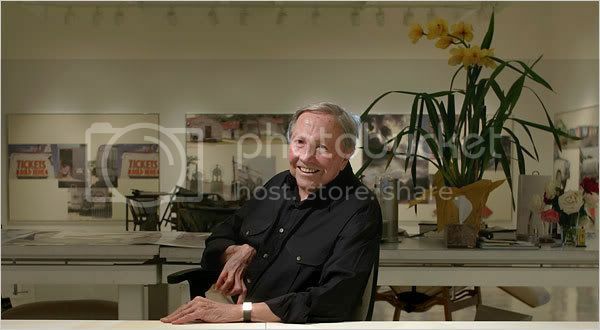 The cause was heart failure, said Arne Glimcher, chairman of PaceWildenstein, the Manhattan gallery that represents Mr. Rauschenberg. Mr. Rauschenberg’s work gave new meaning to sculpture. “Canyon,” for instance, consisted of a stuffed bald eagle attached to a canvas. “Monogram” was a stuffed goat girdled by a tire atop a painted panel. “Bed” entailed a quilt, sheet and pillow, slathered with paint, as if soaked in blood, framed on the wall. All became icons of postwar modernism. Building on the legacies of Marcel Duchamp, Kurt Schwitters, Joseph Cornell and others, he helped obscure the lines between painting and sculpture, painting and photography, photography and printmaking, sculpture and photography, sculpture and dance, sculpture and technology, technology and performance art – not to mention between art and life. Apropos of Mr. Rauschenberg, Cage once said, “Beauty is now underfoot wherever we take the trouble to look.” Cage meant that people had come to see, through Mr. Rauschenberg’s efforts, not just that anything, including junk on the street, could be the stuff of art (this wasn’t itself new), but that it could be the stuff of an art aspiring to be beautiful – that there was a potential poetics even in consumer glut, which Mr. Rauschenberg celebrated. Bob was a great artist and I have been expecting this for a long time but this caught me by complete suprise. He will be greatly missed. Nice work on sharing this Meg.